Ride a bike: My new Schwalbes! Looking good! 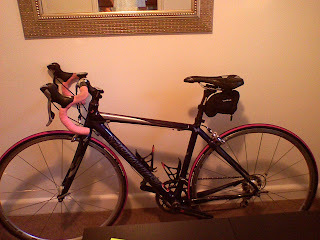 You should totally hit up Selle Italia or Specialized to see if they can make a custom pink butterfly saddle for you. I actually have a pink bag too for under my saddle, but it's a little too big. And Gerry has "lent" me his pedals (spd's- I was riding Look style)- he has given me permission to paint the pedals pink. I think I may just do it.